Veteran weapons inspector Olli Heinonen on how the U.N.’s ‘Stockholm Syndrome’ has aided Tehran’s drive for the bomb–and why an unsettling secret may be lurking in the Iranian desert. Cambridge, Mass.–It has been more than three years since President Obama revealed the existence of the secret Iranian nuclear facility at Fordo—a uranium-enrichment plant buried deep inside a mountain and surrounded by missile silos and anti-aircraft batteries. Is the world due for another surprise soon? If anyone has standing to speculate, it is Olli Heinonen, who says he first “got a whiff” of Fordo six years before Mr. Obama acknowledged it. In the fall of 2003, Mr. Heinonen was in his office at the International Atomic Energy Agency in Vienna when a man appeared unannounced. 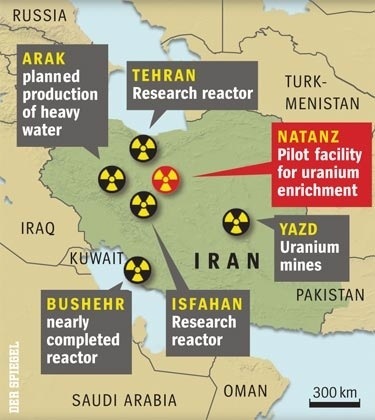 The “walk-in”—whom Mr. Heinonen hasn’t previously discussed, and whose nationality he won’t disclose—claimed that Iran was replicating its existing uranium-enrichment facility in an underground site near the holy city of Qum. And so it was, as the IAEA and Western spy agencies later confirmed. But that isn’t all the walk-in shared in 2003. Also under construction in Iran, he said, was a duplicate of the Arak heavy-water facility designed to produce plutonium. In other words, the walk-in said that Iran had at least two secret sites, and he was correct on the first. What about the second—is there a plutonium facility that remains secret today? A native of Finland, Mr. Heinonen speaks in upbeat, accented English, though his message is a grim one for a grim time. In February alone, North Korea conducted its third and most successful nuclear test; Iran announced plans to install advanced centrifuges that could speed its uranium enrichment by 200%; satellite photos published in Britain’s Telegraph newspaper suggested that some operations have begun at the Arak facility; multilateral talks with Iran mostly yielded plans for more talks (again); Iran rebuffed America’s offer of direct talks (again); and the Senate confirmed as defense secretary a man who couldn’t articulate whether the U.S. intends to prevent an Iranian bomb or live with it. Even assuming that Iran’s regime has no secret facilities, it could go the North Korea route—defined by Mr. Heinonen as deciding “Enough is enough, to heck with this, we’ll build a nuclear weapon”—in “a month or two,” he says. The precise timing would depend on how (and how well) Iranian engineers go about enriching their uranium stocks to weapons-grade purity. But in any case, Mr. Heinonen notes, Iran’s breakout would likely outpace the ability of the “international community” to respond. First, IAEA inspectors would have to detect the breakout. This could take up to two weeks because they visit Iran’s major uranium-enrichment facility about 24 times a year. (Roughly half of the visits are announced, meaning inspectors give the Iranians 10 days’ notice, and the rest are unannounced, meaning about two hours’ notice at any time of day.) Once inside, inspectors would quickly recognize from the enrichment machinery that Iran was dashing to a bomb, says Mr. Heinonen, but that would hardly be the end of the story. The inspectors would formally alert the IAEA board, which takes “a few days’ time.” The board would meet and pass a resolution (which “needs a few days”) and then engage the United Nations Security Council (“also not an overnight decision”). “In reality,” he says, “one month is gone. Well, during that one month [Iran] may have achieved their goal, at least to have enough high-enriched uranium for a nuclear weapon. What next?” Iran would have become the world’s ninth confirmed nuclear state. Mr. Heinonen’s implication is that an Iranian bomb is now simply a matter of Tehran’s will, not capability—despite two decades of international effort to prevent it. How did this happen? Short of military force, there is only so much that outsiders can do to stop a determined regime. But in Iran’s case, Mr. Heinonen says, matters weren’t helped when the IAEA developed “Stockholm Syndrome,” akin to hostages who identify with their kidnappers. Though he praises the professionalism of the IAEA’s world-wide efforts on nuclear safety, Mr. Heinonen is mystified by parts of its record on Iran. Mohamed ElBaradei’s tenure as the IAEA’s director-general from 1997-2009 wasn’t distinguished by its vigilance regarding Iran. He constantly downplayed suspicions (both from Western governments and within his own agency) about Iranian activity, and in 2008 he blessed almost all of Iran’s claims about its nuclear program as “consistent” with IAEA findings. He also wrote articles criticizing international nonproliferation policies for favoring nuclear haves over have-nots. Mr. ElBaradei’s willingness to give rogue regimes the benefit of the doubt extended to Syria: After Israel bombed a site in the Syrian desert in 2007, he told the New Yorker magazine that it was “unlikely that this building was a nuclear facility.” In fact it was—supplied by North Korea, no less. Of Mr. ElBaradei, Mr. Heinonen says, “We had our differences.” He praises his former boss for raising concern about the possible military dimension of Iran’s nuclear program in 2004, but he notes that two events seemed to affect Mr. ElBaradei’s determination. One was the U.S.-led war in Iraq, which Mr. ElBaradei “felt was unjust,” Mr. Heinonen says, and was launched on what Mr. ElBaradei regarded as “a pretext” that the Bush administration might also invoke to attack Iran. The other was the Nobel Peace Prize awarded in 2005 to Mr. ElBaradei and the IAEA. “It had an impact”—a softening one—”on the way we dealt with [Iran],” Mr. Heinonen says. Yet the IAEA stayed mum and remained so for three years while Iran delayed putting the facilities under agency safeguards. “This was never mentioned in public,” says Mr. Heinonen, adding that as he rose through the agency he learned of other such nondisclosures by Vienna’s supposed enforcers of transparency. To this day, Iranian negotiators manage to dampen IAEA criticism despite Tehran’s continued obstructionism. Inspectors have been blocked for years from the suspicious Parchin complex and from Arak, too, for the past 18 months. But by making promising public statements—like those this week announcing further negotiations in March and April—the Iranians “build a kind of hope, and the diplomats buy it,” Mr. Heinonen says. Such figures, he says, can exert a moderating influence on Supreme Leader Ayatollah Ali Khamenei. Here Mr. Heinonen cites a 2003 episode in which former Iranian President Akbar Hashemi Rafsanjani helped convince the supreme leader to reverse his public position against signing an additional-protocol agreement with the IAEA. Then again, as Mr. Heinonen confirms, Iran cheated on that agreement and terminated its implementation after two years, so it doesn’t inspire much confidence. If a grand—and honest—bargain can’t be struck, and Iran is recognized as a de facto or overt nuclear power, then what? Will the Middle East see a nuclear-arms race as rival nations try to catch up? Yet that is only if the countries are “starting from zero,” he notes. Saudi Arabia may already be on the move. An afternoon with Mr. Heinonen provides a sobering counterpoint to happy talk from the Obama administration about “a world without nuclear weapons.” Mr. Heinonen, in his engineer’s uniform of tie and short-sleeve button-down shirt, maintains a certain equanimity about world affairs. Yet the parade of horribles rolls on. Mr. Feith is an assistant editorial features editor at the Journal.